...and a golden eagle... Noah and Christopher celebrate Hallowe'en. Our cat is holding up his flying saucer, which we made from cane (for hoops! ), duct tape, and two trash bags, plus glow sticks for lighting. He's in his mask, has his jeweled collar with special powers of telepathy and the ability to fly, and is sitting on his tail. Ouch. 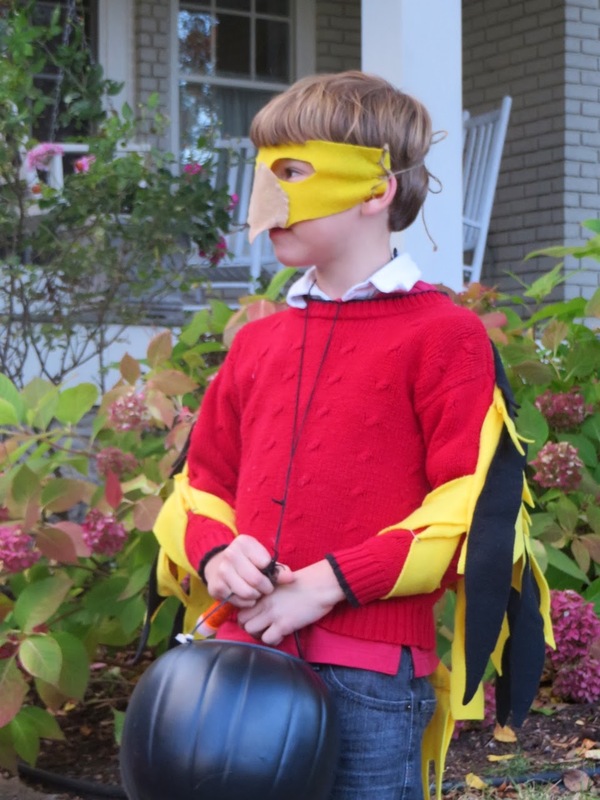 Here is our golden eagle, with beak mask and wings. Both boys have long preferred to dress in concepts applied sparingly, not all over. After this picture, it was off we went, Christopher sitting in his wagon, crouched down under his flying saucer, and Noah leading the way. 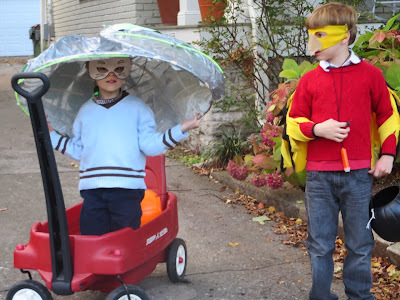 Once at a neighbor's door, Christopher walked down his gangway (the wagon handle), and followed Noah to the door, where they stammered out "Trick or Treat", looked pleased or embarassed depending on whether they knew the neighbor or not, and had to be reminded to thank the givers for the candy. Ah well, it's all good. Tasty, too. Next time, it's back to the cap. I've been be-busied by household events, Cub Scouts, finishing a friend's Edwardian skirt for her, and everything else that makes life good and sometimes a little too much. Will look forward to the quiet of stitching a small thing. Very creative costumes! Did the boys come up with their own ideas for these? I'm especially intrigued by the cat from outer space, and I love that he was rolled around in the wagon and walked down the gangway. What fantastic memories! Good evening! The boys enjoy dreaming and pretending, that's for sure. 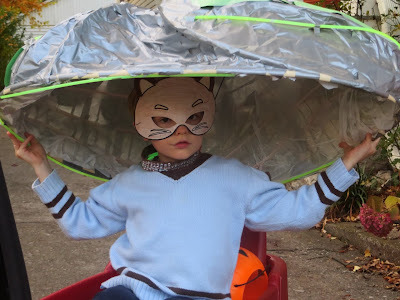 Noah came up with his own idea for the wings and mask. He was going to make them of paper, but I thought they'd be torn in a heartbeat, so used fleece.